Creatine is a molecule produced in the body. It is commonly used as a supplement to help with things such as muscle growth and energy. It’s among the most popular fitness supplements out there and it’s one of the few ingredients that actually has very solid scientific evidence behind it. Creatine is commonly used in both post workout and pre workout supplements – and also on its own as a standalone product. But can Creatine really help with building muscle, boosting energy and exercise performance and more? The purpose of this article is for us to take a detailed look at Creatine to see what the science really says about this supplement. • What’s the Best Dose of Creatine? So, now that we’ve introduced Creatine as one of the most popular supplements out there, it’s time to start taking a look at what the science and studies say about this substance. Creatine is a molecule that is produced in the body. It can found in some foods, including meat eggs and fish. Supplementing with Creatine can cause increases in strength and muscle mass, which are two of the main reasons why people choose it as a supplement. Creatine is also often used by athletes to increase both power output and lean mass. Simply put, supplementing with Creatine helps to increase your muscles’ phosphocreatine stores. Phosphocreatine helps with the formation of ATP, which is the key molecule that your body’s cells use for energy. As well as being useful for athletic performance, Creatine is also known for having both neuroprotective and cardioprotective benefits. We’ll get into this in more detail later on in this post. The bottom line here is that Creatine is a popular supplement that has some of the most convincing scientific evidence behind it when it comes to boosting athletic performance amongst other things. Now it’s time to take a look at Creatine’s specific uses. So, we’ve already deduced that Creatine is a popular supplement amongst athletes and bodybuilders alike. But what does the science actually say about Creatine and its benefits when it comes to muscle building? 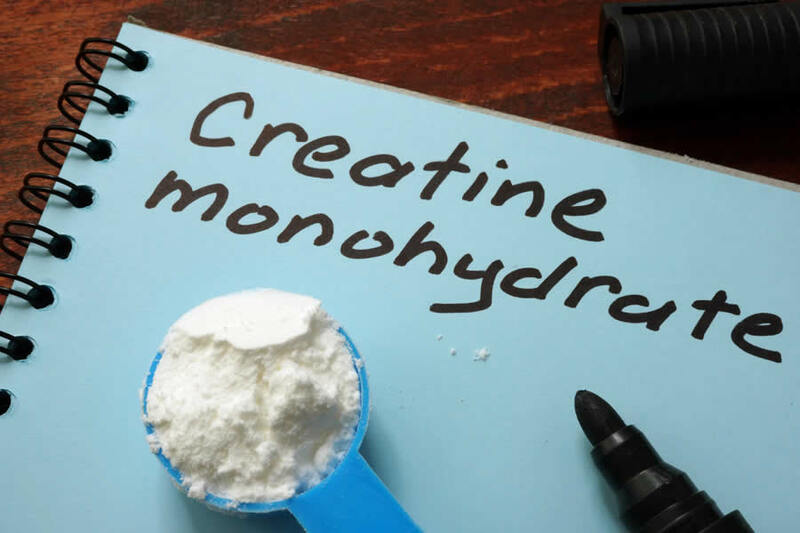 As things stand, Creatine Monohydrate is the most popular and most affordable type of Creatine. It’s also the most extensively studied type of Creatine supplement. Creatine is widely considered as one of the most effective supplements in the world for adding muscle mass. One study from 1999 showed that participants who used creatine during a six-week training program added 4.4 pounds (2 kilograms) more muscle mass, on average, than the control group. Another study showed that supplementing with Creatine led to notable lean mass and strength gains. The bottom line here is that Creatine has a large amount of evidence to so suggest that it will help to increase strength and muscle mass when taken as a supplement. The interesting thing is that many of the studies mentioned above suggested that the benefits from taking Creatine can be experienced in just a matter of days. So, what about using Creatine for energy? We’ve already clearly seen that Creatine is a highly effective supplement for increasing strength and muscle mass. However, what you may not know is that Creatine is also often used for reducing tiredness and fatigue – as well as increasing energy output during exercise. As we’ve already mentioned above, taking Creatine can help to increase your Phosphocreatine stores. Phosphocreatine helps with the formation of new ATP, which is broken down during exercise to produce energy. One study from 2006 showed that supplementing with Creatine helped to reduce fatigue and increase energy levels in people with sleep deprivation. Creatine supplementation may also help to reduce fatigue and tiredness. Creatine is also widely known for being a beneficial supplement to increase energy output during high intensity exercise. There is plenty of evidence to support this claim, including this study from 1995. So, we’ve clearly seen that Creatine can help to boost energy production during intense exercise, and it could also be useful for helping to reduce tiredness and fatigue. So, now that we’ve covered the main two benefits of taking a Creatine supplement, it’s now time to take a look at the other uses it has. In case you didn’t already know, Creatine plays a key role in brain health and cognitive function. In fact, Creatine is vital for normal brain function. Supplementing with Creatine can help to provide your brain with more ATP, which it needs when performing difficult tasks. Creatine is also widely considered to be one of the safest and cheapest supplements around. It has been researched for more than 200 years and numerous clinical trials report no adverse effects in healthy individuals. What’s the Best Dose of Creatine? As we mentioned above, Creatine Monohydrate is the cheapest and most widely-researched form of Creatine on the market at the moment. Most people choose to take Creatine through something called a ‘loading protocol’. This is when you start off with a high daily dose, before reducing it to maintain normal levels. Examine.com recommends that to start loading, you should take 0.3 grams (300mg) per kilogram of bodyweight per day for five to seven days, then follow with at least 0.03 g/kg/day either for three weeks (if cycling) or indefinitely (without additional loading phases). A more simple way of taking Creatine is to just take three to five grams (3000mg to 5000mg) of Creatine Monohydrate per day. As always, you should consult your doctor before trying any new supplement for the first time. It’s always also a good idea to do some of your own research into any supplement that you’re considering taking for the first time. We also always like to remind our readers that sticking to a good diet, getting plenty of exercise and enough rest should be the first things you do before trying any new supplement for the first time. That being said, Creatine is clearly one of the the most widely researched and scientifically proven fitness supplements out there, which is why you’ll find it in so many different supplements these days. That brings us to the end of our look at Creatine for Muscle Building and Energy. We’ve taken a look at how this heavily researched supplement can help to boost exercise performance, increase muscle mass and help to maintain normal energy levels. Creatine can also help with a number of other benefits, including helping with brain health.